Tameka Smith is known as the okra whisperer at McLaughlin Grows Urban Farm, but spend any time with her and it’s clear she can charm pretty much any plant that comes her way. “I love the hunt of it; it’s always hiding,” Smith says of those long green pods known as okra while she bends down to pick two sun gold tomatoes—small, plump, and yellow spheres lining the inside of McLaughlin’s hoophouse—and offers them to me. 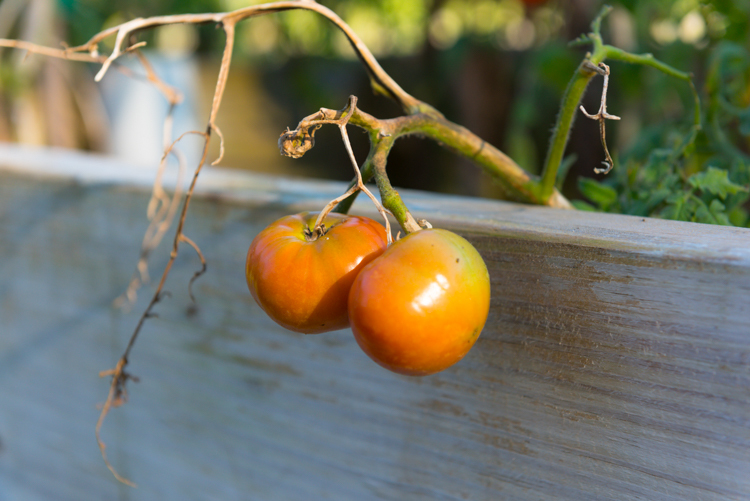 Tomatoes at McLaughlin Grows Urban Farm. Before continuing, she waits for me to confirm. The tomatoes? They’re great. “The best,” she corrects me. But back to the okra. 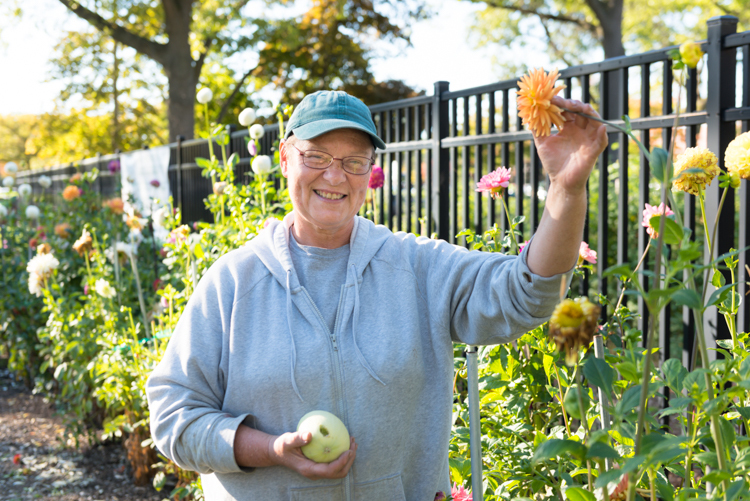 Smith, 42, was born and raised in Muskegon; for a while, she lived not far from McLaughlin Grows Urban Farm, an expanse of green space the nonprofit Community enCompass opened in 2009 and which began operating at its current site at Mercy Health Muskegon’s Hackley Campus in 2012. Mercy Health rents the land to the farm for free. “I lived right down the street from here. I’d ride my bike by the farm, and I was like, ‘What the hell are those people doing?’ Now, I’m addicted to farming. I love the peace; I love that I’m growing something that feeds people,” says Smith, who’s about to end a one-year sentence at the Muskegon Correctional Facility. As part of the prison’s “Pay It Back” program, Smith and other inmates can apply to work at various places throughout the city, including at the farm. “This is what I do now—I’m a black farmer. I have a black thumb and a green thumb,” Smith says, smiling. Working at the farm, she explains, has changed her life, and, when her prison sentence is over, she’s planning to open her own community garden in Muskegon where people can access everything from fresh produce to nutritional information. Additionally, she’s hoping to open a facility that provides affordable healthcare or can connect individuals with healthcare. “I want to open a garden in memory of my sister, Tasha,” Smith says. “She died yesterday; her spleen ruptured. She didn’t have to die; she couldn’t pay for healthcare. You shouldn’t have to die because you can’t pay for healthcare. “I want the garden, Tasha’s garden, to become a means to decrease the risk of getting diabetes and other diseases by teaching people at a young age to eat healthy,” she continues. These are new dreams, Smith explains: when she began working at the farm, she never expected to like it. But, she has, and now Smith does everything from sell produce at the weekly farm stand to meticulously weed the land that provides affordable produce to residents throughout the city, including by offering a “free food forest,” a large section of the farm dedicated to providing no-cost fruits and vegetables—tomatoes, peppers, squash, melons, strawberries, and more—to anyone who wants to come pick them. At McLaughlin Grows Urban Farm's free food forest, anyone is welcome to pick the food they need. Smith’s love for the farm, and her gratitude for growing food that feeds people, are sentiments that resound among the workers at McLaughlin, an agricultural refuge tackling daunting issues that come with the neighborhoods surrounding the farm, and the city at large, being what’s known as a “food desert,” meaning residents live more than a mile away from a supermarket. With major grocery stores, like Meijer, residing miles from Muskegon’s downtown, individuals and families often turn to smaller corner stores offering mostly processed, sugary foods. These foods then contribute to the obesity epidemic that healthcare workers have been battling for years in Muskegon, the third most obese county in Michigan, according to a 2016 state report. 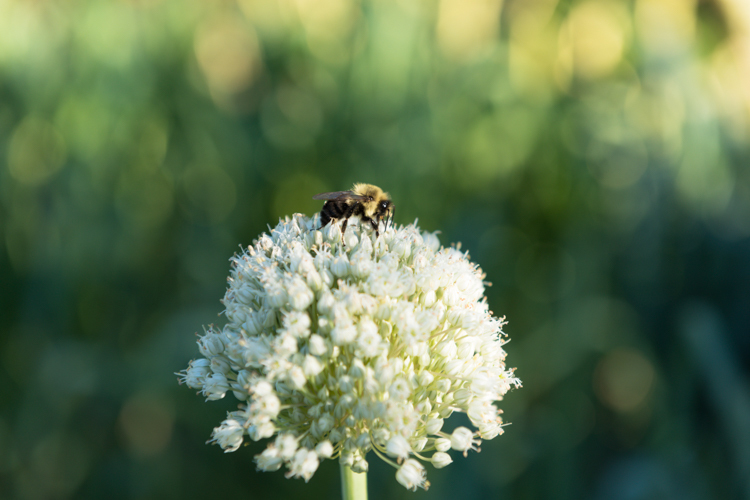 One of many happy bees, and flowers, at McLaughlin Grows Urban Farm. 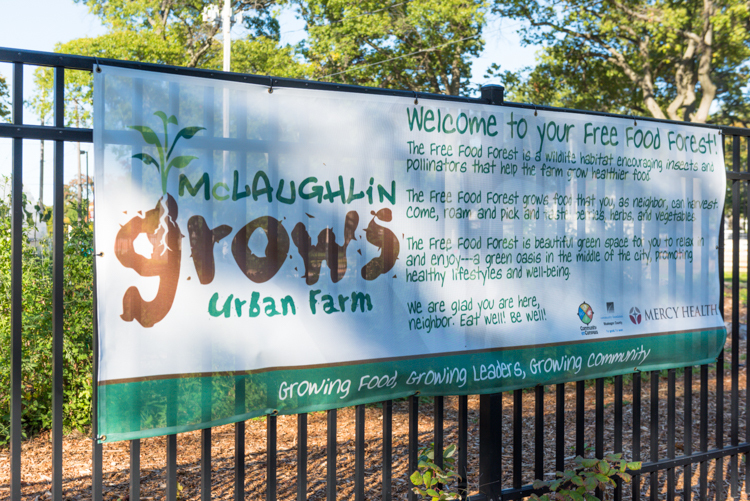 In an attempt to make life a little less hard, provide healthy food, and further foster a sense of community, McLaughlin Grows Urban Farm welcomes anyone in the city (or beyond), but it particularly focuses on those living nearby in the McLaughlin, Nelson, and Angell neighborhoods. These communities make up a diverse area where 43.25 percent of the population is black, 40.25 percent is white, 8.25 percent is Hispanic, and 8 percent is mixed race, according to the most recent U.S. Census statistics. Close to 44 percent of the McLaughlin, Nelson, and Angell neighborhoods lives below the poverty line—a percentage that’s higher than the average in Muskegon, 34.8 percent, and more than double the rate in Muskegon County, 19.2 percent, according to federal statistics. That communities of color in Muskegon do not have the same kind of access to large grocery stores as primarily white neighborhoods is a pattern seen across the country. The American Civil Liberties Union’s Racial Justice Project points out that, nationally, predominantly African American neighborhoods are half as likely as white neighborhoods to have access to chain supermarkets. Hispanic-majority neighborhoods are a third less likely than white neighborhoods to have access to chain grocery stores. Produce at McLaughlin Grows Urban Farm. “[The] root causes of food deserts lie in structural racism and class inequality,” the Racial Justice Project writes in a report on food deserts. “Therefore, to truly solve the problem of food deserts we must challenge the residential segregation, commercial redlining, and other government policies and private practices that perpetuate disparities in food access in low-income minority neighborhoods. “We must, in short, admit that, no less than lack of access to fair housing and equal employment opportunities, the lack of access to healthy food is a mark of inequality, a violation of basic civil rights, and a denial of fundamental human dignity," the same report states. Of course, dismantling structural racism is a long-term goal; in the meantime there are thousands of people facing limited access to healthy food in Muskegon—where community leaders and residents have long wanted a grocery store. That absence of a supermarket has left civic leaders, business owners, and other residents to figure out different ways for people to access fresh fruits and vegetables—which they’re doing through major efforts like McLaughlin Grows Urban Farm, the Community Foundation for Muskegon County’s HEALTHY Muskegon program and the Muskegon Farmers Market. Through these initiatives, everyone from nonprofit leaders and students to doctors and farmers have teamed up to bring lasting, sustainable change to the city in the form of hundreds of community gardens, access to free produce and nutritional classes, doubling the amount an individual using Electronic Benefit Transfer [EBT] cards can spend on produce at the farmers market, offering healthier school lunches for children by connecting schools and local farms, and much more. “Doctors understand how important fresh food is,” Wieschowski says as she rounds the McLaughlin Grows Urban Farm’s first-ever greenhouse that's now being constructed and heads for the farm's new children’s corner, where local middle school students recently finished building plant beds for strawberries, tomatoes, sweet basil, and more. 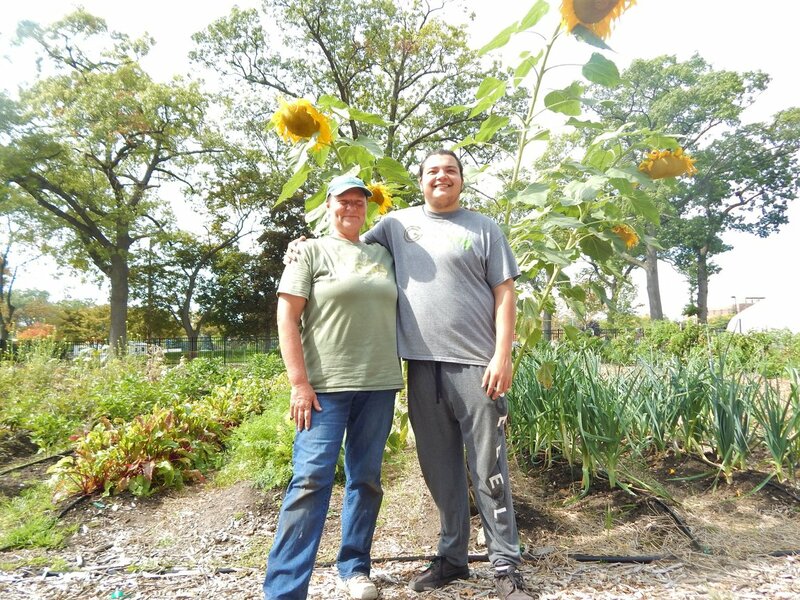 Laurie Wieschowski, the farm manager at McLaughlin Grows Urban Farm. That’s why, the farm manager explains, Hackley Community Care recently partnered with McLaughlin and the First Congregational Church on Jefferson Street to launch a pilot program, Muskegon Prescribes Food for Health, for which Community enCompass received a grant from the U.S. Department of Agriculture. Kicking off Aug. 15 with 24 participants, the pilot project will end Oct. 31. As part of the program, doctors identified people with chronic diseases whose lives could be dramatically improved by eating fresh and healthy food. The individuals then receive free produce from the urban farm, and First Congregational Church provides nutritional and cooking classes for the participants. Community enCompass expects to grow the program with a larger group of people next year through further grant funding. “At the resident participant level, we want to change lifestyles,” explains Marty Gerencer, the project lead for Muskegon Prescribes Food for Health and an avid advocate of changing food systems to increase healthy living in our city and across the country. “We’re out to increase their health; they learn how fresh fruits and vegetables, and healthy food, can change their lifestyle. In addition to working to empower individuals, the program aims to change the way health systems interact with patients. “At the institutional level, we’re working with the healthcare providers at various levels throughout Mercy Health to look at what this food-health connection can mean for hospitals and health systems,” says Gerencer, explaining that better access to healthier foods translates to fewer emergency room visits and an overall healthier population that wouldn’t need expensive care for chronic health conditions, like diabetes or heart disease. Of course, it's not just those involved in Muskegon Prescribes Food for Health who explore the link between fresh produce and health at the farm. For example, McLaughlin partners with younger residents in a variety of ways, including welcoming students visiting the space on field trips and hosting children from Muskegon Middle School's summer program. "We work with them for a few days every week and teach them about growing, about the power of working together and doing something for their community," Wieschowski says. Gage VandenBosch, an AmeriCorps member and assistant farm manager who's currently studying at Muskegon Community College to become an EMT, is planning an ambitious educational program that will further engage children from the surrounding neighborhoods. "Mentoring youth is my favorite thing to do here," says VandenBosch, one of an extensive team of volunteers at the farm. As part of significantly expanding youth programming at the farm, he plans to focus on empowering teenagers. "Gage will spend time with them and nurture their interests," Wieschowski says. "They're not just learning how to grow food; they're learning they can do things for themselves and their community." In 2011, Muskegon landed near the bottom of the University of Wisconsin’s annually published health rankings for Michigan, leaving healthcare workers, government leaders, and others determined to inspire change for a population that was overweight and had limited access to healthy, affordable food. From this, HEALTHY [Healthy Eating and Access—Local Teams Helping Youth] Muskegon was born after Gerencer prompted the Community Foundation for Muskegon County to apply for a $676,000 grant from the W.K. Kellogg Foundation, which the organization received. Committed to ensuring everyone in Muskegon County has access to healthy food from local sources, HEALTHY Muskegon has gone on to support an extensive list of organizations and initiatives working on food insecurity, including McLaughlin Grows Urban Farm, the Muskegon Farmers Market, an expansion of Double Up Food Bucks at the farmers market, hundreds of community gardens, a proliferation of school gardens, an increase of healthy items at food pantries, and more. 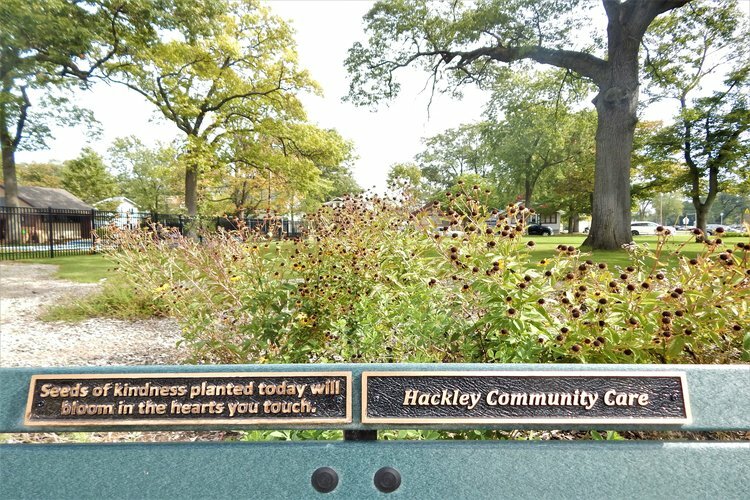 “It also started an endowment fund; this becomes part of our work forever moving forward,” explains Janelle Mair, the director of grantmaking at the Community Foundation for Muskegon County. Following the $676,000 grant, the Foundation landed a new $315,000 grant in late 2015 from the Michigan Health Endowment Fund. This allowed the Foundation to award funding that resulted in local produce being used in AgeWell Services’ senior meal programs, the creation of the “Senior Power of Produce” initiative at the Muskegon Farmers Market, and a project to redistribute the farmers market’s unsold produce to area food pantries, among a host of other programs. All of this, Gerencer and Mair explain, amounts to serious change that’s being embraced at numerous different levels: individual residents, nonprofits, government, businesses, and healthcare, among others. It’s connecting organizations and people working to battle food insecurity; increasingly cohesive and united fronts are emerging when it comes to improving health and quality of life in Muskegon. Every Saturday, waves of people descend upon the downtown Muskegon Farmers Market, their eyes set upon a sea of fruits and vegetables at the 164 stalls that house about 50 local growers each week. Between 10,000 and 12,000 shoppers come through the farmers market’s downtown location on any given Saturday, with many of those at the market being participants of the Supplemental Nutrition Assistance Program (SNAP), a federal initiative that provides financial assistance to low-income individuals and families for food. Muskegon Food Culture from MOVE Media Production on Vimeo. Double Up Food Bucks, a program from the Ann Arbor-based Fair Food Network, provides privately-donated matching dollars to recipients of SNAP, colloquially known as food stamps, when they purchase locally-grown produce at farmers markets and participating grocery stores. In Muskegon, the program became a success almost overnight. Within just a couple years of its launch, it helped farmers to sell about half a million dollars' worth of produce—representing a 40 percent jump in sales for the market. The implementation of the Double Up Food Bucks program “changed things on a dime,” Primmer says. To further reach individuals who are economically disadvantaged, as well as to better connect with the public in general, the market launched its “Kids Power of Produce” program in 2014, which provides funding for children to purchase their own produce at the market. Thanks to the popularity stemming from the children’s program (about 700 children sign up for the program each summer), the market launched its “Seniors Power of Produce” initiative in 2016 for people ages 62 or older. They, too, receive free tokens which they can use to purchase goods at the market. Other recent efforts that have helped to address food insecurity in the area include the launch of a gleaning project by Pioneer Resources—a nonprofit that provides housing, transportation, employment, and more for people with disabilities in Muskegon County. Pioneer sends an individual to the market every Saturday to pick up produce the farmers couldn’t sell, which is then redistributed to local food pantries or other food-related organizations, like Meals on Wheels. Now in its second year, the gleaning project has collected more than 10,498 pounds of food—9,034 of which was put back into the community through 23 local organizations. An additional 1,463 pounds of collected food was composted, with the composted material being used to provide nutrients to three area community gardens, including one at Pioneer Resources. 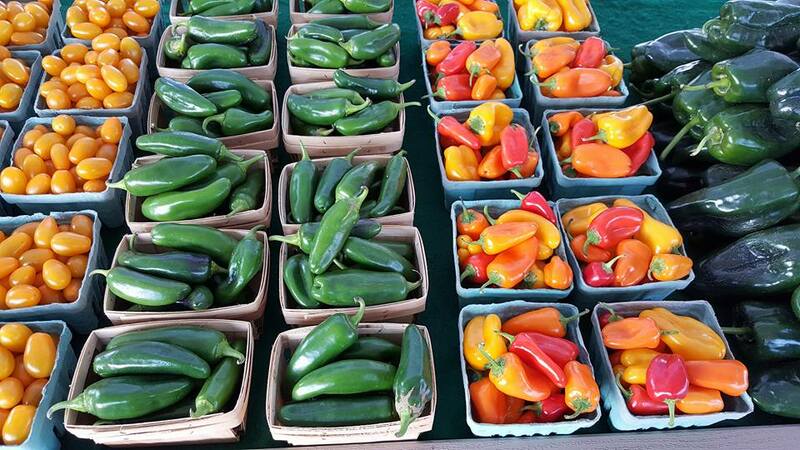 One of the market’s most recent projects is the Muskegon Food Hub pilot program, which launched in the beginning of May and is a partnership between the farmers market, the Community Foundation for Muskegon County, Consumers Energy Foundation, and the city of Muskegon. 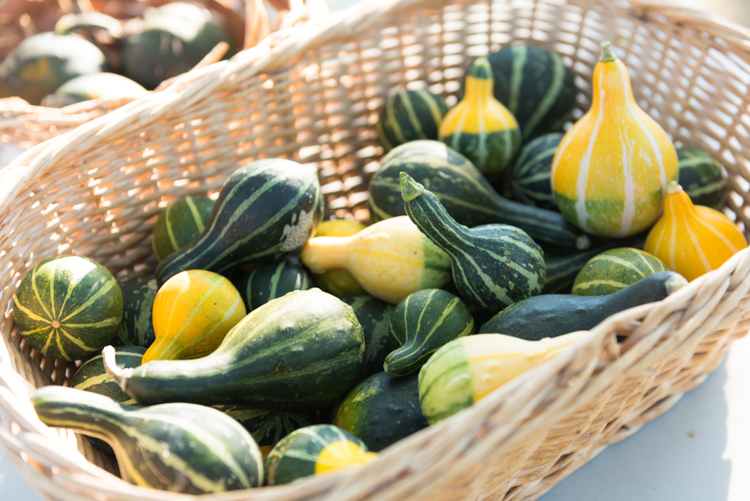 Hosted at the farmers market every Tuesday, the food hub allows farmers to sell their produce wholesale to businesses and other local organizations. Currently, farmers involved in the food hub are selling to such customers as AgeWell Services, which is using the produce for its Meals on Wheels program; Kids Food Basket; Muskegon Public Schools; Whitehall District Schools; and Montague Area Public Schools. The pilot program will continue through October, after which it is expected to be expanded and sell to such customers as hospitals, restaurants and others. Photography by Jenna Swartz unless otherwise noted. Connect with Jenna on her website and Facebook page.